What is Digital Transformation? Why is it important? What does it mean for you? Your business? Your future? Bob Plumridge is the Chief Technology Officer for Hitachi Data Systems in Europe Middle East & Africa. In this role Bob is responsible for aligning technology vision with business strategy and evangelising this vision to the press, analysts, existing and potential customers. Greg Kinsey heads the Industrial IoT business at Hitachi Insight Group, with overall responsibility for strategy, innovation, product portfolio, and business P&L for digital transformation solutions in the manufacturing industry. 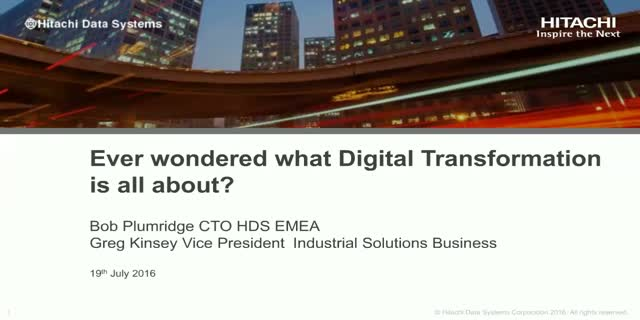 Title: Ever wondered what Digital Transformation is all about?